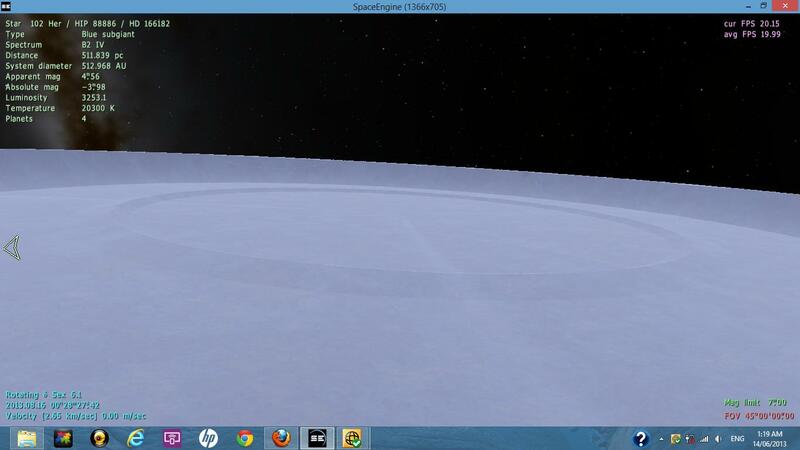 Forum » SpaceEngine » Space Journeys » Weird system. This is one of the 9 moons of the 6th planet of an inappropriately named star! I'm not sure if I can state the name here but if you look around in the screenshot you'll be able to find the name. This isn't the only weird feature I saw in this system, the farthest moon of the same planet is a cold asteroid with street-like bumps everywhere. Are you using version 0.97? Because there are only 4 planets for me. I also don't see anything innapropriate about the star's name. Edit: Oh I see, that's just short for the constellation Sextans. Yeah I know it's wierd. It might be considered inappropriate by some. I see it in the screenshot, although it won't show up in SE for me. It's really just an abbreviation of Sextans, which is a constellation named from the instrument called a sextant (take your pick whether the astronomical or navigational version). Still though, wierd that the star isn't the same as what I'm seeing in SE. Going to try and see what greek symbol that is in the screenshot. Anyways, titanousbont had me confused by selecting a different system than he actually was in (I thought he was at 102 Hercules). As far as the asteroid (besides the fact that it has wierd wrinkles on it), the street-like lines are a known bug. Yeah I know it's wierd. It's not weird. Constellations are abbreviated by the first three letter of their name, or first letter of first name and first two letters of second name if it has a two-word name. Literally anything could be considered "inappropriate" if someone chose to view it that way, but people like that tend to lack perspective. I think you mean Sextantis. Sextans is the nominative case. The constellation name in the stars Bayer or Flamsteed designation is genitive since you're referring to an object belonging to the constellation. Going to try and see what greek symbol that is in the screenshot. I mean wierd as in it's just funny that it happens to spell that word. Anyways, as far as the moon in the screenshot, there were some odd ray craters, but I didn't take a closer look. Well, Hercules abbreviated is Her. Is that weird? Is it weird that Andromeda abbreviated is And? And what about Sagittarius abbreviating to Sag? Or Fornax to For? Or Gemini to Gem? Many constellation abbreviations spell words. There's nothing weird about it. Never mind about it anyway. rogo, a better place for that post would be in this thread.